Part two of a tale on the voyage of the TSS Belgic, passengers travelling on board the ship experienced a bit of a rough trip. The ship sailed from Liverpool on September 23, 1911 and arrived at Fremantle on 11-11-1911. November 11 is a date which has much greater significance nowadays, but was also a significant date for the ships passengers those who arrived in 1911. 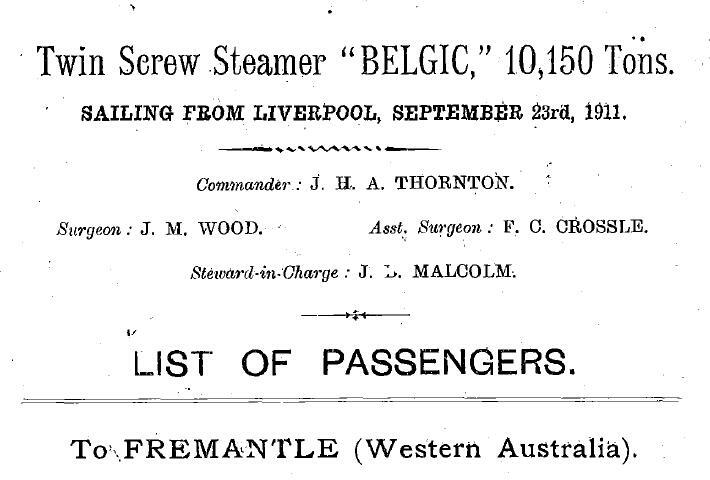 There was 925 passengers on board bound for Fremantle with many others bound for Adelaide (252), Melbourne (203) and Sydney (168), 1,548 passengers in total. The tragedy of the voyage is outlined in the second of our stories about the Belgic. Part two of the Belgic story is now on the WAGS Blog, along with the passenger list in a searchable flip book.